Published online in Genome Biology, the study by researchers in Germany identified genetic mutations that have deactivated genes related to colour vision, as well as other mutations that have enhanced the kiwi’s sense of smell compared to other birds. The kiwi is an evolutionary phenomenon, and an endemic species to New Zealand, a land that was geographically isolated after its separation from Godwana 80 million years ago. This isolation makes New Zealand ideal for studying evolutionary processes. The kiwi is a flightless bird with low metabolic rate, and the lowest body temperature found in birds. It is chicken size, but lays much larger eggs, and has nostrils at the end of its long bill. It is already known how kiwi forage for food. “Kiwi in the wild use both the sense of smell and the sense of touch for everything they do,” Kiwi expert Dr Isabel Castro, Behavioural Ecologist at Massey University, told Radio New Zealand. Castro has worked closely with brown kiwi in the wild and observed how they use their sensitive bill to navigate in darkness, moving it from side to side. They locate prey by sniffing and by sensing vibrations in the ground as they probe. Little is known about their genetic evolution, however. This genetic study aimed to improve understanding of kiwi adaptation to a nocturnal, ground-dwelling lifestyle, and the genomic changes involved in this adaptation. Researchers wanted to understand the genetic basis of kiwi traits, including the kiwi’s sensorial adaptation, and which variants are responsible for the absence of wings, lead author Diana Le Duc told biotech company Illumina. The national symbol of New Zealand, the kiwi is the smallest and only nocturnal member of the ratite family that includes the extinct New Zealand moa and Madagascan elephant bird, and the extant Australian emu, African ostrich, New Guinea cassowary, and South American rhea. A previous study identified kiwi as diverging from the Madagascan elephant bird 50 million years ago, suggesting that ratites dispersed by flight. There are five species in the kiwi genus Apteryx. This new study’s international research team, led by Torsten Schöneberg of the Institute of Biochemistry of the Medical Faculty at the University of Leipzig and Janet Kelso of the Max Planck Institute for Evolutionary Anthropology, have sequenced the genome of the brown kiwi, Apteryx mantelli. Because the kiwi is an endangered species, DNA had to be obtained from abandoned eggs that were not used in the BNZ Operation Nest Egg program, said Le Duc. 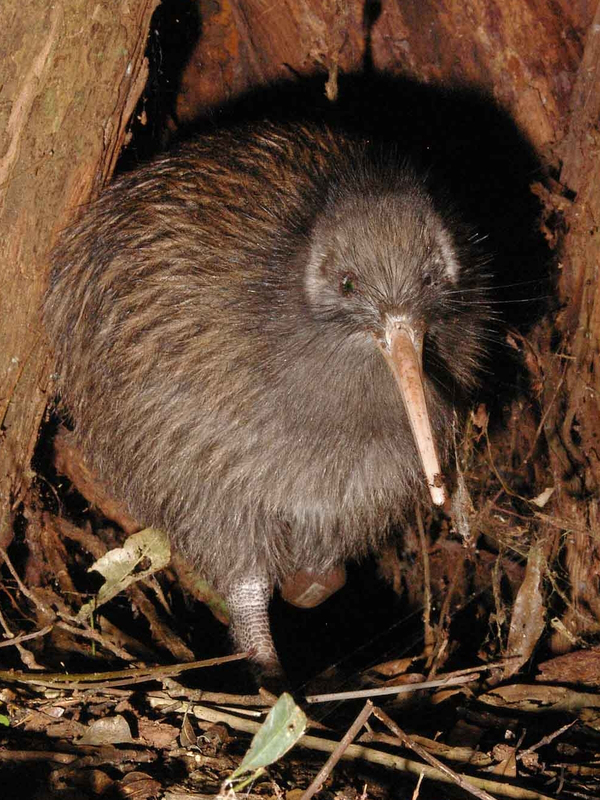 Kiwi have small eyes compared to other nocturnal species, but they have a higher proportion of rods than cones, which is usual in nocturnal species. Colour vision in the green and blue range was found to be absent, and this genomic change was timed at around 30-38 million years ago. Researchers in this study found that genomic changes in kiwi vision and smell are consistent with changes thought to occur in mammals as they adapt to a nocturnal lifestyle. On the basis of the ‘use it or lose it’ principle, Le Duc said it is likely that the kiwi lost its colour vision because it was no longer needed in its new nocturnal lifestyle. However, the kiwi’s sense of smell required for foraging in the dark became more acute. Dr Castro said that although it was known that kiwi have many olfactory receptors, this genetic study shows they may be sensitive to many more smells than ever thought before. This newly sequenced, assembled and annotated kiwi genome will provide data for comparison with other extinct and extant diurnal ratites. DNA analyses of two kiwi individuals show there could be little genetic variability in the population, which could further impact the species, predicted to become extinct within 50 years at the current annual population decline of 2 percent. Dr Lara Shepherd, Genetics Researcher at Te Papa Museum of New Zealand, welcomed the new genetic data, but said it wouldn’t stop the decline of the kiwi, which was mainly due to predation by introduced mammals. The NZ government’s budget announcement of funding for kiwi conservation will help with predator control as well as breeding programs, which will benefit from the extensive genome information. Le Duc expects in future to be able to translate the results to benefit research into human limb and vision development.